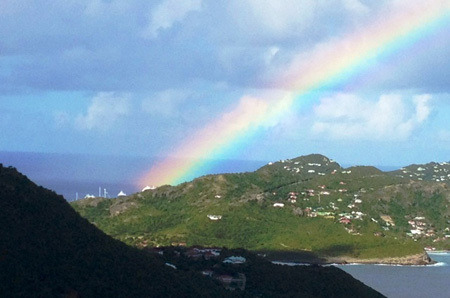 The weather here in St. Barts is beautiful; it is about 80 degrees today and will be about 72 degrees tonight. The water temperature is in the high 70’s. We do get occasional showers and 5 minute downpours which helps keep the island so lush. The rainbows here are outstanding. Here is a picture of one that I took this morning. Last week I went to check out the “new” Les Embruns, one of our most popular villas. In fact, the villa was so booked that this was my first chance to see it. Our photographer was taking new photos during a 4 day opening so it worked out perfectly. New decks have been added. One is open for sunning while the other one is covered and offers outdoor living. That deck is located across from the existing outdoor dining gazebo. 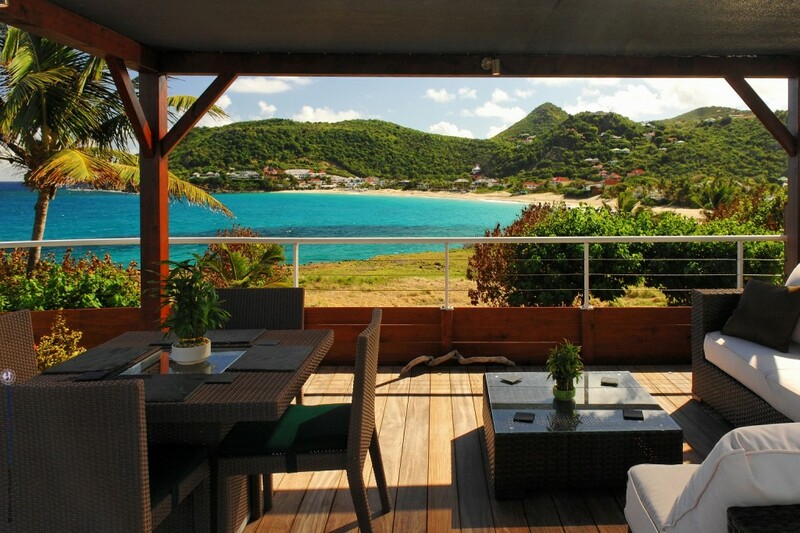 Who wouldn’t like to spend the most time possible outside on gorgeous St Barth? During the day the sun is shining and the view is gorgeous. Return from dinner in the evening, relax in the new heated Jacuzzi and then enjoy a digestif while gazing up at the stars. For more information on Villa Les Embruns, please contact reservations@stbarth.com. 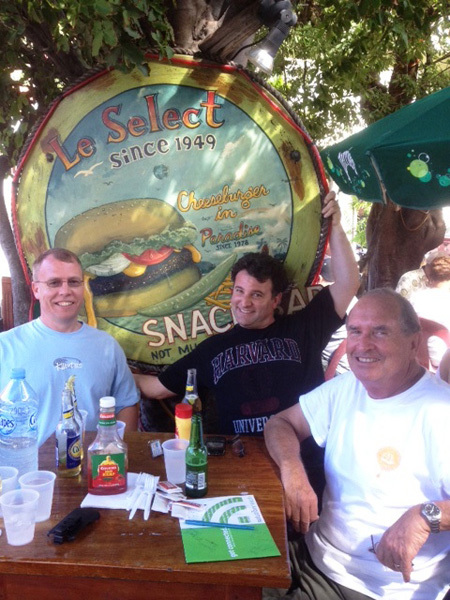 This week the annual meeting of the St. Barth Dental Association is taking place. My son Dr. Mark Smyth arrived here on Sunday to attend the meeting. For those of you who don’t already know, my husband Steve is a dentist so he is taking the course with Mark as is an orthodontist friend of ours Dr. Patrick Assioun. The lecture takes place each morning at the Capitainerie in Gustavia. When they take their breaks, they can go outside on the balcony and look at the mega yachts in the harbor. 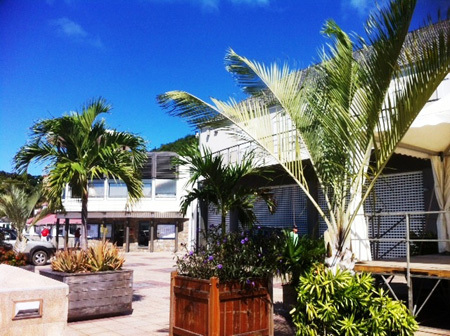 Their afternoons are free to enjoy St. Barts. What a nice way to get CEU’s! If you are a dentist and interested in attending the SBDA meeting in 2013, let me know and I will send you information once the speaker is announced. Coincidentally, my other son and VP, Tom Smyth arrived here on Tuesday. Tom is the liaison for people who wish to buy property in St Barts through our company St. Barth Properties Sotheby’s International Realty. He is here to inspect new listings and we also are meeting with the on-island staff to go over business matters. Steve and I are leaving warm and sunny St. Barts tomorrow and flying back to snowy and cold Boston because I want to go the Patriots AFC Championship game on Sunday. It is supposed to snow so I hope our flights won’t be canceled. My daughter gathered up all of my winter gear so that I can be warm during the game. I hope I won’t be disappointed in the outcome. The last time I flew back for a playoff game, the end result was not good, so I hope I don’t jinx the game. We are flying back to St Barth on Tuesday. By the time I write my next blog we will al know which teams are going to the Super Bowl. This entry was posted on Friday, January 20th, 2012 at 12:08 pm	and is filed under St. Barth Dental Association, St. Barth Real Estate, Villas. You can follow any responses to this entry through the RSS 2.0 feed. You can leave a response, or trackback from your own site.